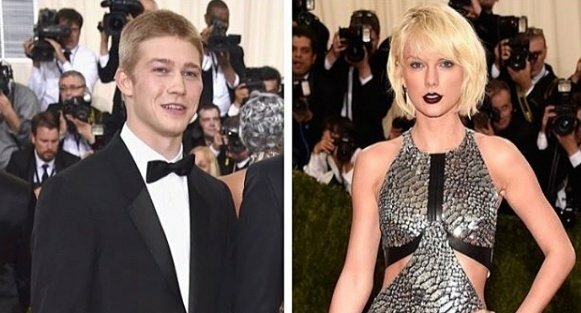 In the past, Taylor Swift’s relationships have been highly publicised, but such is not the case when it comes to her relationship with British actor Joe Alwyn. The pair have been together for almost a year, creeping up on two, and the details of their romance have been kept under wraps. However, from the small bits that we’ve seen, these two are seriously adorable together and their love is thriving. We love to see our girl happy, so we’ve put together a timeline of Joe and Taylor’s relationship, including the sneaky clues from lyrics off of her album ‘Reputation’. You might be thinking “hold on, isn’t this the same Met Gala where Taylor and Tom Hiddleston had their famous dance off before they got together?”. The short answer is, yes is it. However, a lyric from Tay’s song “Dress” makes us think maybe there was another significant meeting that night. Taylor Swift and a couple members of her squad attend a private Kings of Leon concert in New York. It’s reported that Joe Alwyn is not only seen at the same concert, but was also seen attending the same after party. Coincidence? We’re thinking not. Between October and April the couple goes to great lengths to keep their relationship under the radar. Seriously. Taylor visits Joe in England in disguise (like scarves, sunglasses, wigs) just to keep from being spotted. Finally, in May, the news of their relationship breaks and the world now knows the pair have been dating in secret. Joe visits Taylor in Nashville and they have a cute coffee date. It’s reported that Joe has met some members of Taylor’s infamous ‘squad’ and we’re guessing they approved of her new beau. Since Joe is younger than her two previous exes Calvin Harris and Tom Hiddleston, we’re going to take a not-so-wild guess that these lyrics are about him. The pair are also frequently crossing the pond to visit each other, still keeping a relatively low profile. Whether the aforementioned boyfriend is Tom or Calvin Harris, both are older than Joe, meaning these lyrics are 100% about him. “He’s really nice. Really, really friendly, really good dude”. Taylor Swift released her highly anticipated album ‘Reputation’ and fans are quick to piece together which songs/lyrics are about Joe. Around the time Tay and Joe met, her love life was in the spotlight. She’d recently broken up with Calvin Harris, and was beginning a romance with Tom Hiddleston, and unfortunately the media had plenty to say about it. Joe and Taylor are seen at the Jingle Ball cuddling up with each other during Ed Sheeran’s set and it’s SO cute. An eagle-eyed fan was able to take a quick video of the pair. Taylor kicks off her Reputation tour in Arizona and Joe Alwyn is there supporting her from the crowd. Fans catch her pointing at him during her song “Gorgeous”. Could these two be any cuter? The two are spotted vacationing in Turks & Caicos over the July 4th weekend.